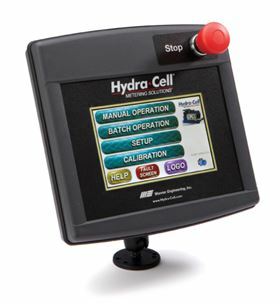 The ‘Control Freak’ Hydra-Cell multi-function metering controller. As motor speed is directly proportionate to flow rate in a Hydra-Cell pump, high accuracy can be achieved through the use of Variable Frequency Drives (VFDs). With an easy to use, 7 in colour graphic touch-screen user interface the technology provides optimum speed control based on your desired flow and pressure ratings. You can enter the desired flow rate or volume along with system pressure and the controller automatically runs the pump at desired flow rate or volume total/time, or in pre-set batches. With four configurable on-off relays, ten separate batch set-up screens and two user-configurable analogue input displays, this versatile controller enables programming for flow rate or totalisation. Pre-set (with password protection) for Hydra-Cell pump performance algorithms, the ‘Control Freak’ can also be field-calibrated for greater accuracy. The ‘Control Freak’ also has analogue and digital I/O for interfacing with external devices and includes a real-time clock. Safety features include emergency stop, loss of power, fault monitoring, and optional pump oil temperature probe.